William George Bruce (1856-1949) was the force behind the creation of Immigrant Mother. Bruce was a newspaper business manager in Milwaukee born from German parents. He established the Bruce Publishing Company, and is best known for his efforts in developing and administering the Milwaukee Auditorium. The esteemed businessman was president of the Milwaukee Harbor Commission and instrumental in developing Milwaukee's position as a world port on the Seaway. He even published a three-volume history of the City of Milwaukee. "Due to his distinguished public service career, Bruce gained the sobriquet 'Mr. Milwaukee." 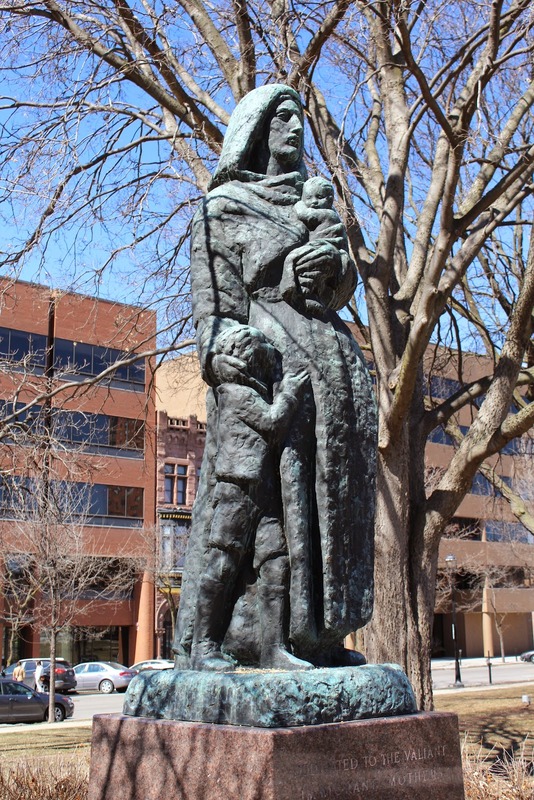 Bruce bequeathed $30,000 to the city of Milwaukee for the creation of a sculpture that symbolized universal motherhood. It was to be dedicated to his mother, Apollonia Becker Bruce, as well as to all immigrant mothers bringing up children in the New World. 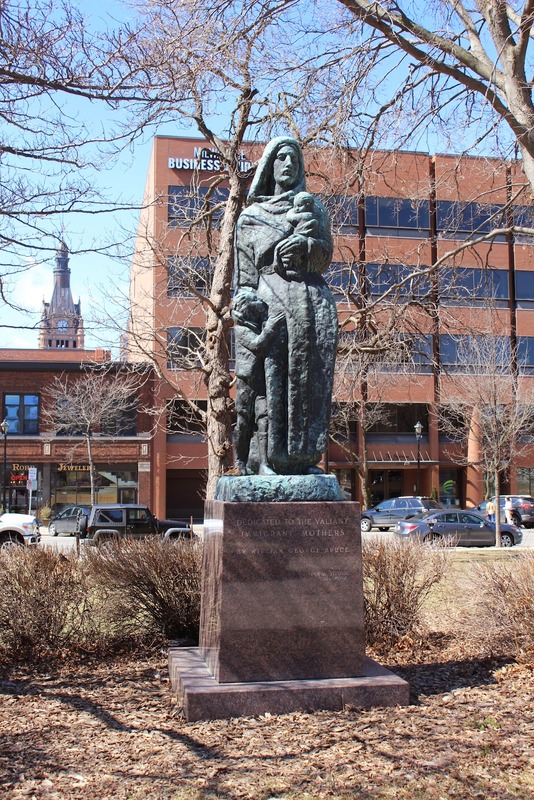 "Bruce's heirs chose Ivan Meštrović to carry out this commission as Meštrović had immortalized his own mother's image in many of his religious sculptures; Milwaukee's Immigrant Mother may be an example of this homage." Immigrant Mother was placed in Cathedral Square in recognition of Bruce's lifelong devotion to the Roman Catholic Church. The sculpture demonstrates the dignity of motherhood. It depicts a mother carrying one child, with another child at her side, in a simple figural style. Tool marks are apparent on the sculpture's rough surface. Ivan Meštrović (Croatian: [ǐʋan mɛ̂ʃtrɔʋit͡ɕ]; August 15, 1883 – January 16, 1962) was a Croatian sculptor and architect. He is renowned as one of the greatest sculptors of the 20th century. He was the first living person to have a one man show at the Metropolitan Museum of Art in New York City. The statue is adjacent to the Court House Square marker.